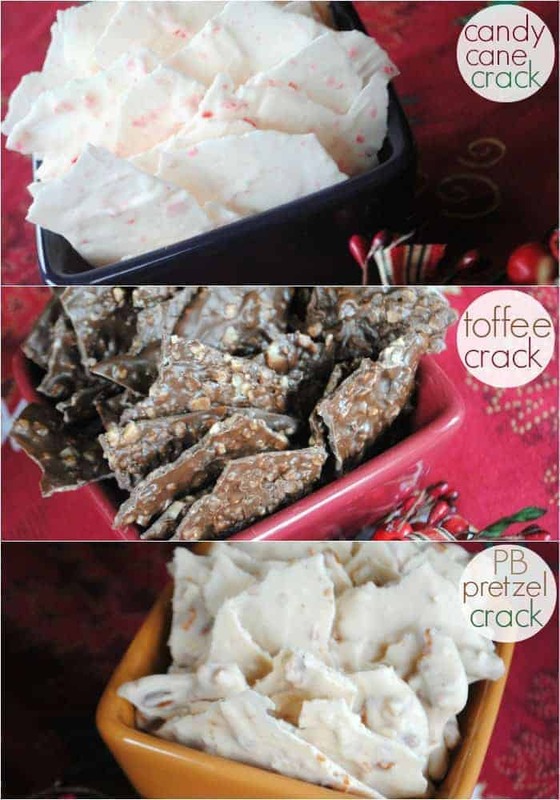 Holiday Candy Crack- Three ways! This is not your average peppermint bark. This is crack. Wait. What? I always made my peppermint bark very thick, until I met my awesome neighbors Greg and Kari. Greg’s mom always made peppermint bark very very thin. Oh, and she called it Christmas crack. Isn’t it funny how you get to calling something by a name, but once you have kids it might make you reconsider? Kind of like this white trash candy. Back to the crack. I decided to add a little pizzazz to my crack this year by make three different flavors. 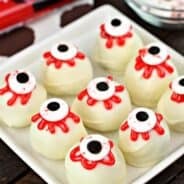 Bonus for all of you, THREE recipes today! The first is traditional peppermint. The second is peanut butter pretzel. And the third is toffee, think Heath bar in crack form. Remember, the key to crack is spreading it very very thin! Enjoy!! For the Peppermint Crack: Melt chocolate in small saucepan on low heat. Stir constantly until smooth. Remove from heat and fold in crushed candy canes. Lay out a piece of wax paper. The key to making it how I enjoy it is to spread VERY thin. Using a spatula, keep spreading until you can see the wax paper. Let dry and then break into pieces. Store covered in ziploc container. For the Peanut Butter Pretzel Crack: In small saucepan, melt white chocolate and peanut butter together on low heat. Stir constantly until smooth. Remove from heat and fold in crushed pretzels. Spread on parchment paper until very thin. Keep using a knife and spreading until the paper is able to be seen. The thinner the better! Allow to set. Break into bite sized pieces and store in ziploc bag. Enjoy! For the Toffee Crack: Melt milk chocolate in small saucepan on low. Stir constantly until smooth. Remove from heat. Fold in crushed toffee. Spread VERY thin on parchment paper, using a knife to keep spreading until it won’t spread any further. Allow to set. Break into bite sized pieces. Store in ziploc bag. Enjoy! I am glad to hear we aren’t the only people with a crack habit. 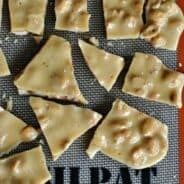 We make peanut butter, clustershttp://nolagirlatheart.wordpress.com/2011/12/13/no-bake-cookies-measure-stir-drop/ , sometimes called white trash but almost always referred to as crack. 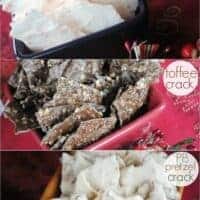 Should you choose to make these crack clusters I recommend leaving out the rice cereral. Definitely Crackalicious! I love making barks, they are so easy and you can put in all kinds of things. I prefer it thin like this too. Good ideas!! I want that peanut butter pretzel crack! All of these look so good and I can definitely see that the name fits well. I could eat way too much of this! definitely gonna be addicted to this crack. Oh my gosh this all looks heavenly! 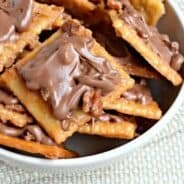 i need to spend a day just making this, im a sucker for heath bars 🙂 thanks for posting! I need some crack!!! I think I’m going to make your Peanut Butter one!! Thank you so much for sharing this recipe. The peanut butter version is FANTASTIC! I brought it to work (used regular chocolate chips instead of white chocolate) and everyone was asking for the recipe! I’ve made it twice since then using the white chocolate – I never imagined it could get better!!! Thanks!